Before I show you the product card, the makeup bag or the other goodies I received, a word for those who came in late - Lip Factory is a monthly makeup subscription that ships worldwide. They send out full-sized products and allow customisation of colours. Boxes cost $22 a month if you are in the US and $32 worldwide. If you are subscribing, do quote reference number 385650 so we get 50 points apiece, which can be redeemed against products or boxes. Enough intro. On to the box. 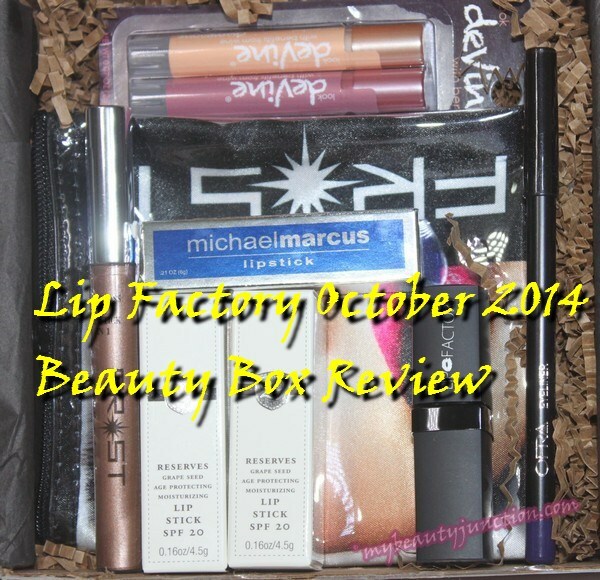 Read on for my review and unboxing of the Lip Factory box for October 2014. First, take a look at the product card. You can click on each photograph to enlarge it. Lip Factory Lipstick in Nirvana - Replacement for broken lipstick in previous box. Seven products, all full-sized. The Lip Factory lipstick is a replacement, so we are not going to count it. Now a quick look at each. Slightly larger than Ipsy bags, this is a vinyl bag with inner polyester lining. Good to stash away a lipstick, an eyeliner, a compact and a couple of other necessities for an overnight trip or even to keep in your desk at work. I am always running out of bags but this is vinyl and cheapish, get my drift? I hope Lip Factory continues to send out makeup bags once in a while, but maybe not vinyl ones. These are shimmery moisturisers for the lips, rich in resveratrol (ingredient found in red wine), grapeseed oil and other antioxidants. They are 100% natural, cruelty-free, alcohol-free, pesticide and paraben-free and gluten-free. I got Champagne and Bordeaux in this set. Both smell amazing - like sweet, mellow wine! The tints don't really show up on me; these are more lip balms than makeup. Much to my disappointment, neither of them tastes like their respective names. 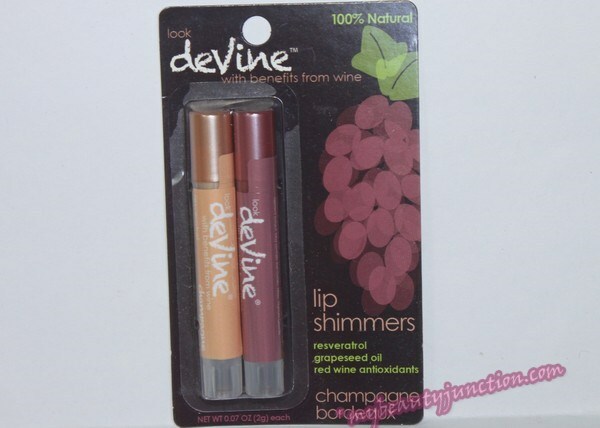 A lip balm tasting of red wine or champagne - now that is something I would use up in one day. If any manufacturers are reading this, please think about producing wine-flavoured lip balms and lipsticks and I'll be your first customer! Both of these are definitely going into use. I like whatever products from Michael Marcus I have tried so far - all of which have been courtesy of Lip Factory boxes. This is the first time I'm trying out the brand's lipstick. 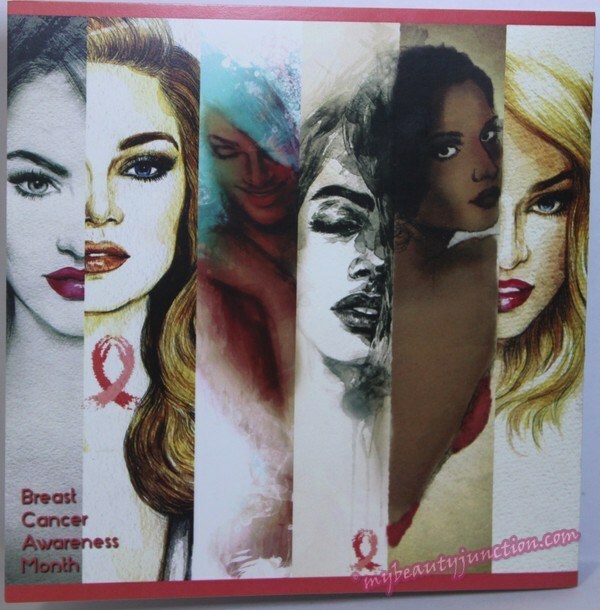 The packaging is quite nice - reminiscent of Lancome Rouge in Love with the glossy-matte finish combination. I got the shade Desire, which is a very pretty pink; mild enough to be worn in the daytime, at the same time bringing in a bit of colour. It feels very creamy, though it does not last through food or drink. Love the shade, and will definitely use it up! Swatches and more photos are further below. 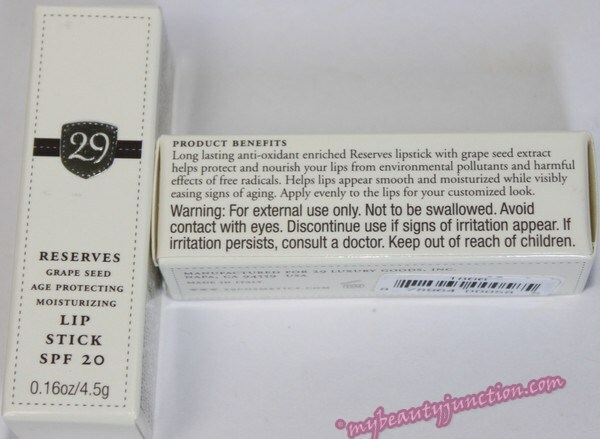 I am a huge fan of 29 Cosmetics and love it when Lip Factory sends out their products, most of which contain grape seen extracts and are therefore rich in antioxidants. Their lipsticks are somewhat shimmery. I got Ripe Rose, which is actually a rose gold! I've never seen such a shade before. I also got Sparkling Shiraz in lieu of lip glosses. The latter is a fuchsia-ish pink. Both will be much-loved! Swatches are further below. This was a replacement for broken Lip Factory lipstick in a previous box. I had received the shade Brazilian, which was a very pretty neutral. Unfortunately, it was smashed up in transit. This time, they had said they were out of Brazilian (pun unintended) and sent me Nirvana, which is the palest beige and washes me out entirely. I'll have to use it as a lip balm at night or pass it on to someone who looks like Edward Cullen. 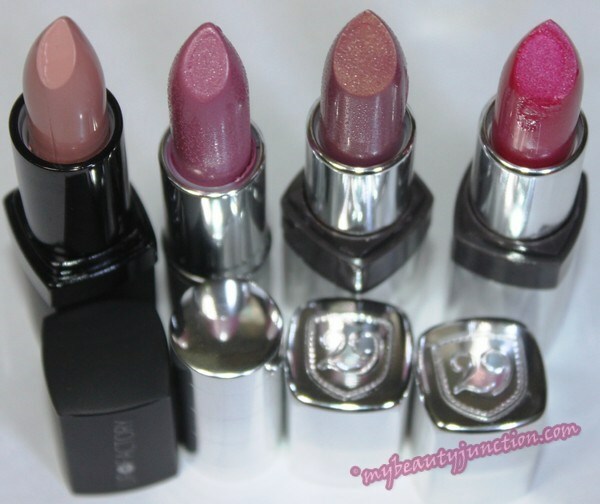 From left, here are the lipsticks. 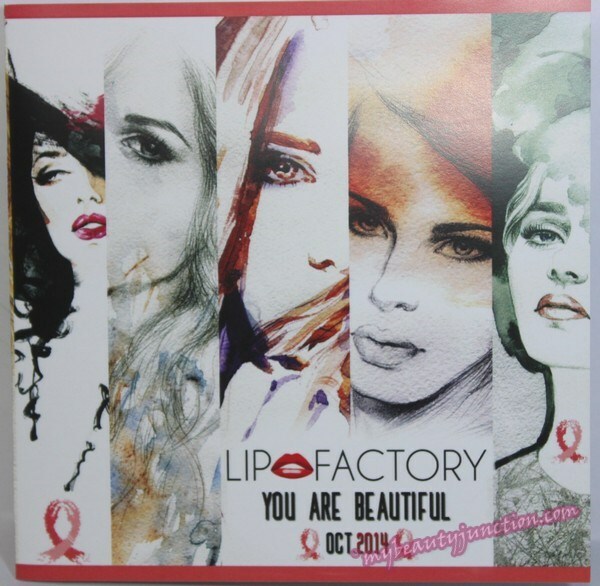 Lip Factory in Nirvana, Michael Marcus Desire, 29 Cosmetics in Ripe Rose, and in Sparkling Shiraz. 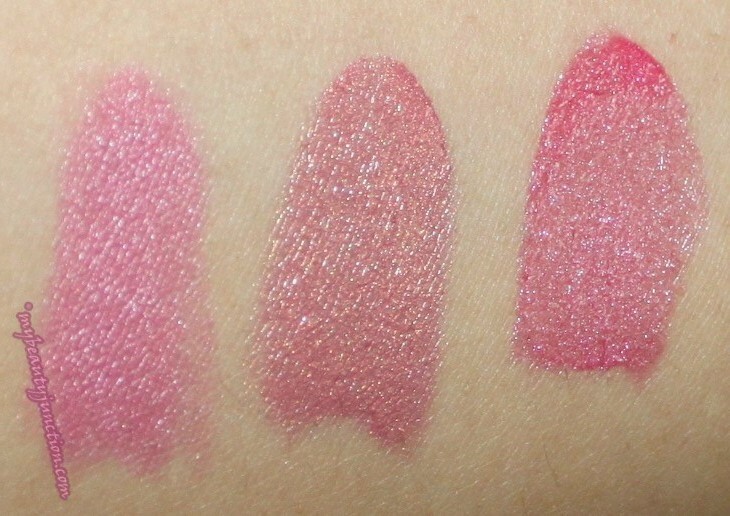 Swatches, from left: Michael Marcus Desire, 29 Cosmetics Ripe Rose; 29 Cosmetics Sparkling Shiraz. I think I have got an Ofra eyeliner before, though it was certainly not blue. This is one of two products in this box that does not wow me. It is not very intense and needs a few swipes to work out. Here are the swatches - single swipe and two swipes (from top). I'm talking about the third swatch just below the photograph. 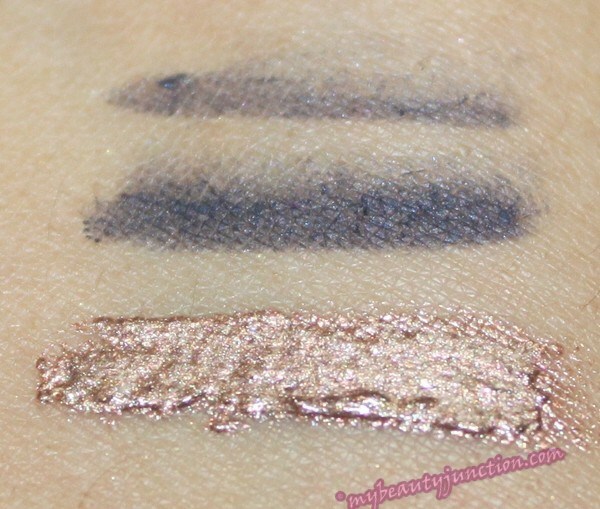 This is swatched in the photo above. 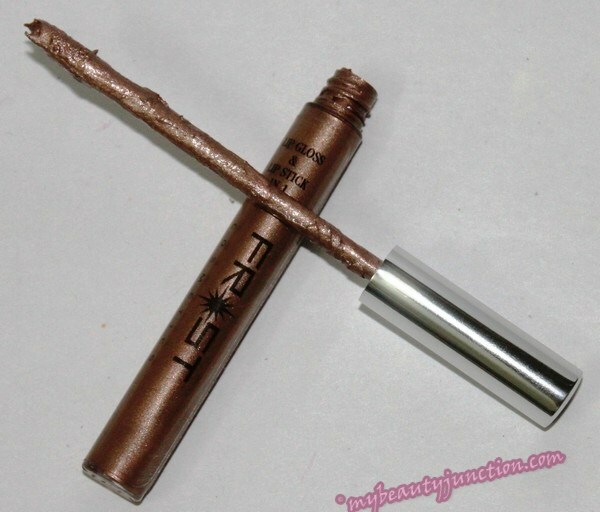 I fail to understand how this can possibly be worn on the lips by anybody at all - it is a bronzey-gold eyeshadow colour! I first thought it was indeed a cream eyeshadow. I would rather not have received this. I cannot think of any purpose for which this can be used. Apart from the Frost Cosmetics Lipstick-and-Lipgloss, I love everything I received in this box. The lipsticks are all great. The lip balms smell delicious and are very creamy. Perhaps a liquid or gel eyeliner, and keeping out the Frost lip product would have made this box perfect! Because I have been subscribing from June 2013 (wow, how time flies! ), Lip Factory keeps lipgloss out of my box after repeated pleas from me, and inserts an additional product of similar value, which is why my box sometimes differs from other spoilers. November is the all-lips box and I am so excited. I hope they send out a lip primer and a lip scrub, apart from lipsticks. You can subscribe here; quote reference number 385650 for 50 points apiece!